I haven't done remote sensing work in a long while and have been wanting to get back into. Remote sensing is a great complement to GIS, and I've been looking for a case study to do a short tutorial. I thought the recent flooding on Kauai Island on April 14-15, 2018 would be a good case to do some flood mapping using remote sensing techniques. The Island of Kauai is not called the Garden Isle for no reason - it is one of the rainiest place on Earth. On April 14-15, 2018 unprecedented rains caused major flooding and a series of landslides on Kauai. The National Weather Service recorded 27.52 inches (685 mm) of rainfall in the Hanalei area during the 24-hour period from April 14 to the 15. After the flooding, the County of Kauai was declared a state of emergency. Assessment of flooded areas can be done using radar data, such as the Sentinel-1 SAR imagery provided by the European Space Agency (ESA). For this example, I'm using Sentinel-1 Level-1 Ground Range Detected (GRD) data which already has some basic pre-processing done on it. More info about the Sentinel missions, products, and uses can be found on the Sentinel Online Website. Access to the Sentinel data is provided through the Copernicus Open Access Hub. Although the data is free to use, you will need to register or sign up first before you can download the data. There should only be 1 result based on the search criteria for the area of interest. Note: when you click the link to download the file, you may be asked again to login (think this might be a time out issue on the Copernicus site). Notice the available imagery is Level -1 Ground Range Detected (GRD) Sentinel-1 C-band (SAR-C) data collected in Interferometric Wide (IW) mode, allowing for an image acquisition over a 250km swath with resolution of 10m (5x20m). SNAP is a application developed by the ESA to work with Sentinel data. You will need to download and install the appropriate software for your computer. I am using the Windows 64bit version of the Sentinel Toolbox. After you've install the SNAP application, you can use it to open and explore the Sentinel-1 image you downloaded previously. The SNAP application can open the zipped file without need to unzip it first. The Product Explorer Panel on the left shows relevant information/metadata related to the Sentinel data. You can right click on any of the file/item to get a context menu to view properties related to that item. Under Bands, you'll see that for each polarization (VV + VH or HH + HV), there are 2 bands (Amplitude and Intensity). Intensity band is a virtual band and is just a square of the amplitude. To view an image of a Band, double click it and an image will be created for viewing in the left panel. Double click on the Intensity_VV band to view it - this is the band being used. Note: Although any of the polarization/band can be used to analyze flooding extent, some studies have shown that VV gives a slight advantage when delineate flooding when using Sentinel‐1 data. This article, "Multi‐temporal synthetic aperture radar flood mapping using change detection" provides a good comparison using different polarizations for delineating flooding using Sentinel data. 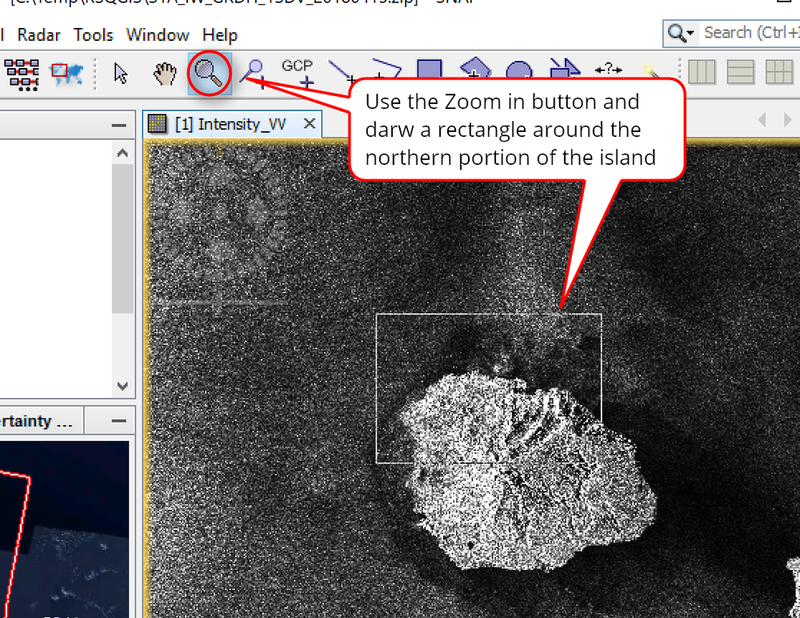 To create a subset a portion of the island, first zoom in to the extent of the area you want to subset - which in this case is the northern portion of the island where Hanelei town is located. The newly created subset image should show up in the Product Explorer panel and look something like this. 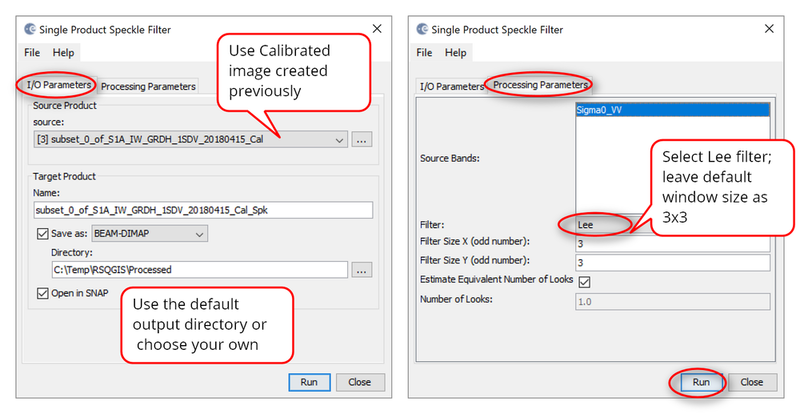 Pre-processing calibration and speckle filtering here is done on the subset image you created in step 3 above. 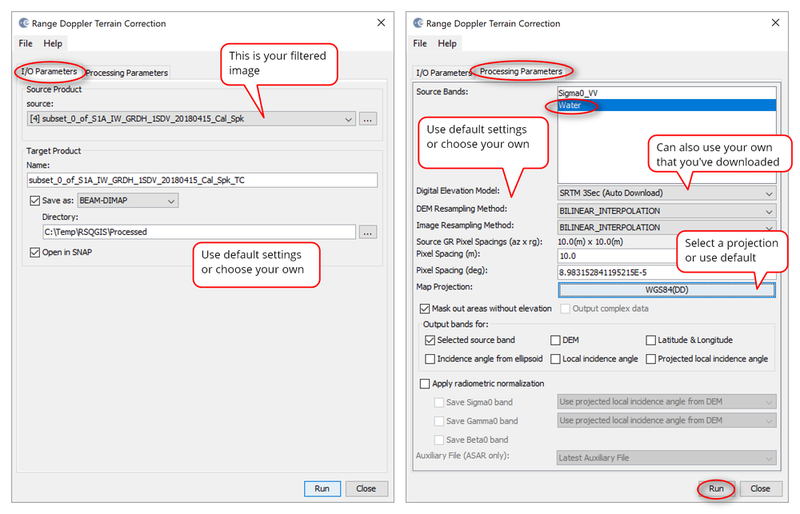 The pixel values in a SAR imagery can be related to the radar backscatter of the scene taken - what calibration does is transform the pixel values from the digital values recorded by the sensor into backscatter coefficient values -- essentially calibrated values of the backscatter coefficient. Speckle filtering is just reducing the noise in the image so to obtain higher quality imagery. Using a histogram of the filtered backscatter coefficient and applying a threshold, the water pixels can be separated from the non-water pixels. I think of this as a form of unsupervised classification - you apply a threshold value and let the software decide what is considered water and what isn't. After this first pass you could further refine results using a supervised classification method (not covered in this tutorial). In the Color Manipulation tab: a histogram is displayed showing one or more peaks. Low values of backscatter will correspond to water and high values to non-water class. You will need to use a threshold value to get the best representation for water. After determining a good threshold value, the next step is to create a new image - basically a binary image of water (1 = true or 255 = white) and non-water (0 = false or 0 = black). To do this you would use a raster math calculation. Go to Raster Menu >> Band Math..
A newly create Water image will be added to your product. An example result is shown below. Notice that since Kauai is surrounded by ocean so it makes it harder to determine flooded areas on land. I guess a quick work around solution would be just to clip the image to the coastline so ocean is seen as "flooded" areas. 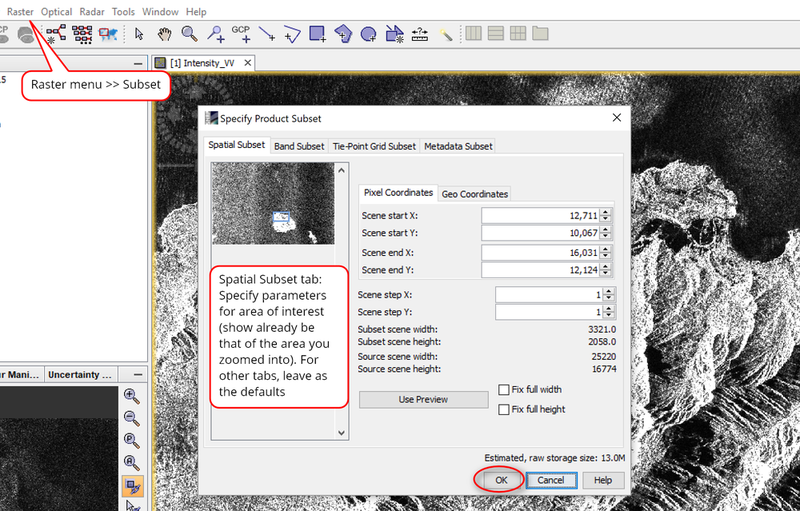 The Sentinel-1 image that was downloaded is in the geometry of the sensor, meaning it does not have geographic coordinates so you will need to applying a coordinate system if you want to view it in a GIS with other data. At the point you should be able to use the output result in an GIS - the default output format (from step 6 above) is an *.img format. 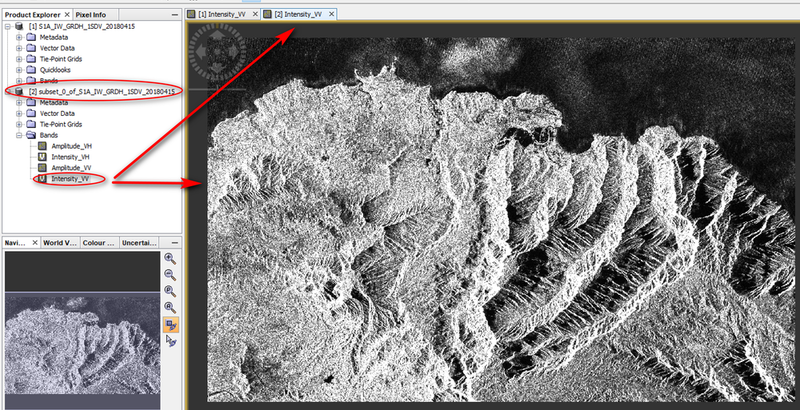 If you want to export it to other formats or view in Google Earth you can do that as well. Here is an example resulting flood image as view in QGIS 3.0. In QGIS just add in your *.img or exported image and use the layer's properties to change color and transparency of the image. Flooded areas are shown in RED in the image. The Dartmouth Flood Observatory at the University of Colorado (previously at Dartmouth College) have mapped the maximum observed extent of the flooding on Kauai - see DFO Flood Event 4601 USA (Kauai, Hawaii). This can be used to assess how well your results are. The snapshots below show the comparison between the more accurate DFO Observed Flooding and the tutorial result. I would say that tutorial result is not bad given that no refinement was applied to the methodology other than using the SNAP geoprocessing defaults. A more accurate result could have been attained by using different thresholds, and doing some post-editing or processing to further refine the flooded areas such as supervised classification to weed out false positives (wrong classification of water). Also keep in mind that no other supplement data were used except the Sentinel-1 data. 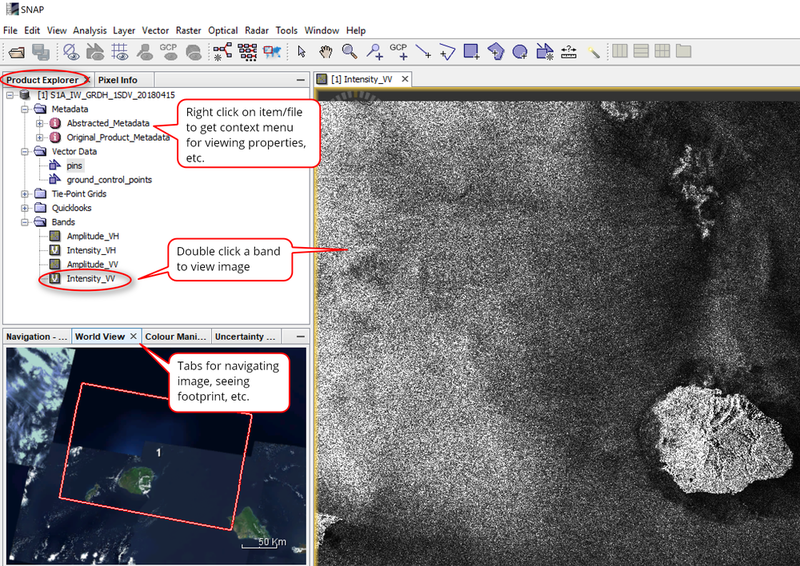 Anyway, the point of this tutorial was just to get you thinking about remote sensing application. That is it for this tutorial. I hope it got you thinking more about applying or using remote sensing in addition to GIS. As always thanks for reading.